The temporary bridge is known as an Acrow bridge, featuring a truss-like moveable span and paved wood deck. 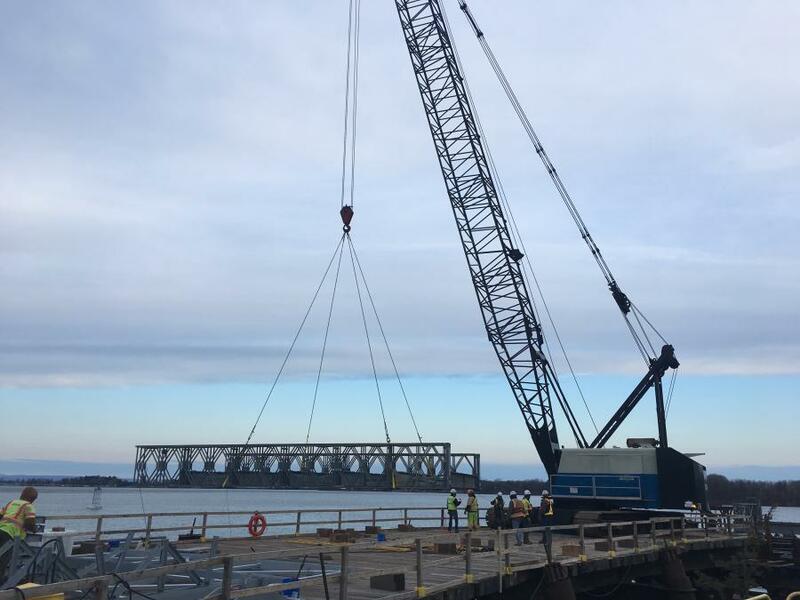 The contract calls for it to be operational by May 15, the date the drawbridge traditionally operates for boat traffic. 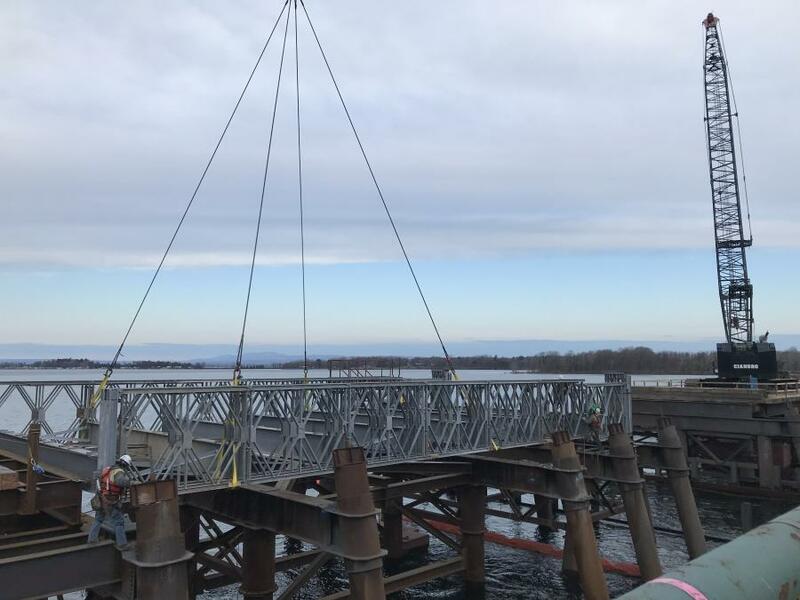 After less than a year of work, construction crews with Cianbro Corporation are on track to open a temporary drawbridge connecting two islands on Lake Champlain in Vermont. Work on the $60 million project began in July 2018. It involves first constructing the temporary bridge. Once that is operational, they'll demolish the existing bridge and get to work on building a new North Hero-Grand Isle bridge in the same place. The existing bridge was built in 1953 and is the only vehicular moveable bridge in Vermont. 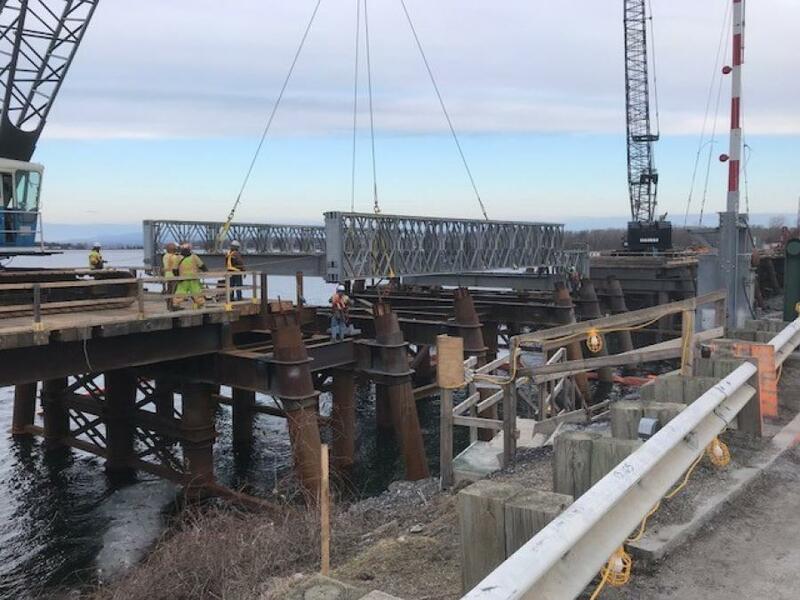 "Right now, they've completed several spans leading to the part that opens and several spans leaving the bridge to get back onto land," said Todd Sumner, senior project manager with the Vermont Agency of Transportation (VTrans). 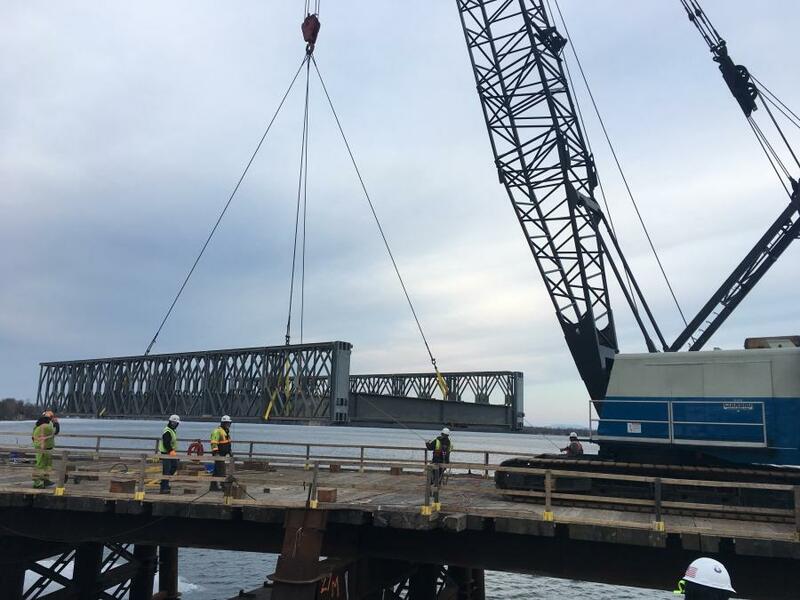 "One of the spans is going to open and let boats through. The other spans are fixed. 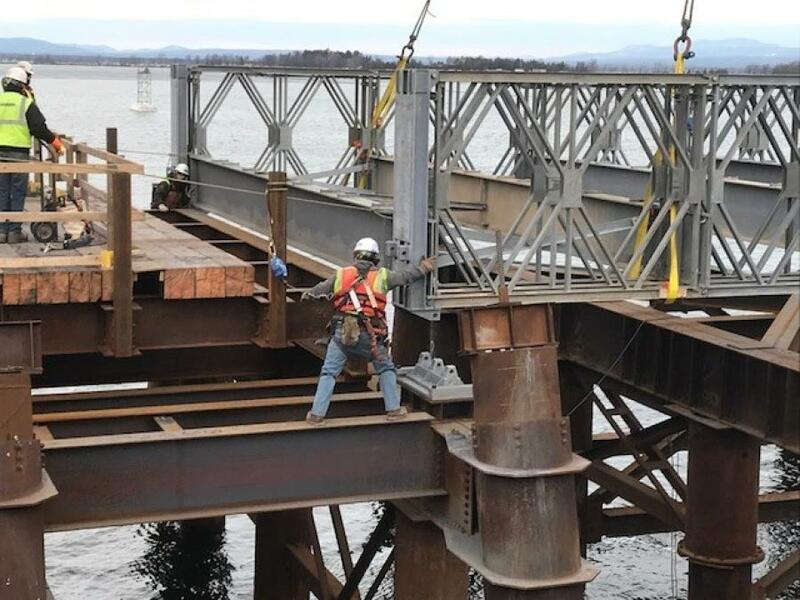 They've got all the fixed spans done. Now, they are working on moveable span. They are just starting to assemble some of it on land and will use cranes to lift it and put it into place." 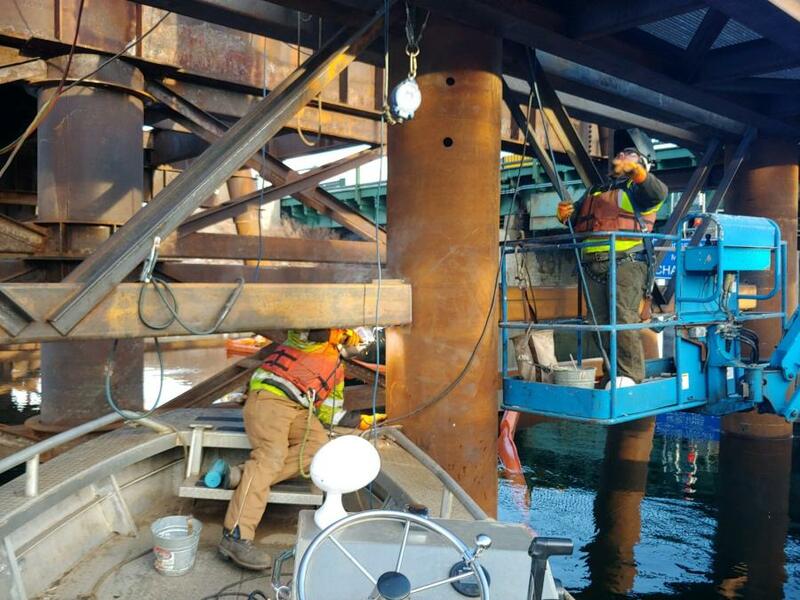 Replacing the historic twin leaf bascule bridge comes not because of the bridge itself, which Sumner said is in good shape physically, but because the mechanical components are not. "The actual capacity to carry traffic is fine," Sumner said. "The motors, the electrical, all the mechanics are in really bad shape. The state has been sinking money into it for years just to keep it running. If this project got delayed, there is no guarantee we would be able to open this bridge in the future. There is a risk of not being able to open this bridge." Were that to happen, the state could face a $25,000 fine every time it failed to open. The bridge carries an average of 3,000 vehicles a day in the offseason and double that in the summer and fall. It also provides the only unrestricted access for boats, and is the only route big sailboats can get through. 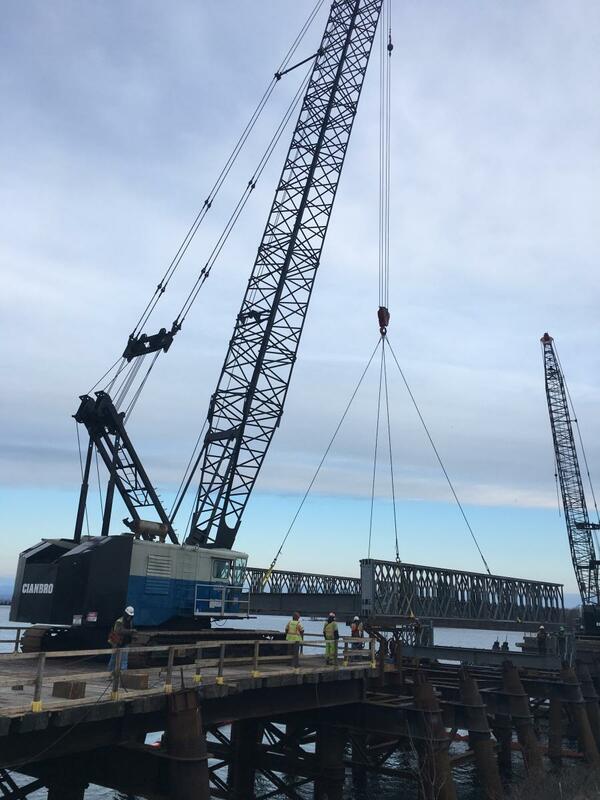 In the coming weeks, crews will install the final timber decking for the temporary bridge, while rock anchor installation continues on the temporary fender system. 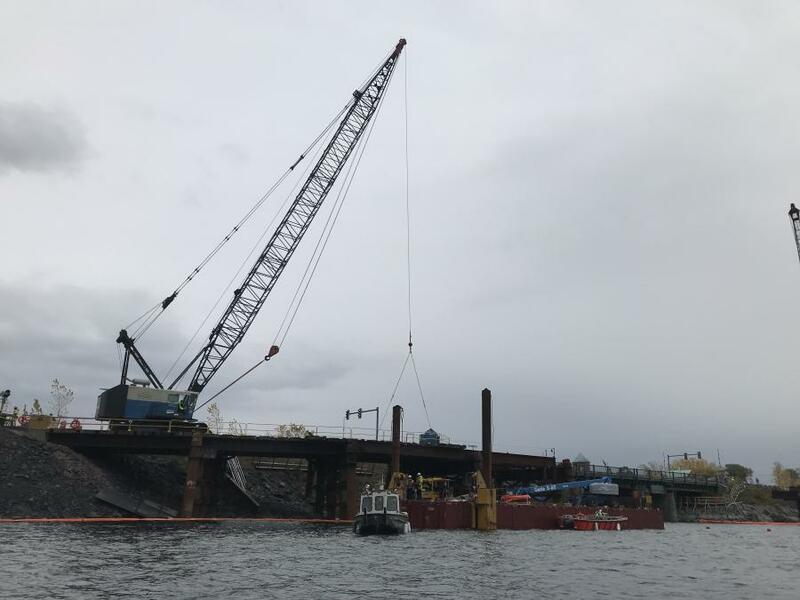 Crews are working from a barge for the rock anchor installation. They also will begin installing the temporary bridge barrier gate foundations. The gates are designed to withstand impact and prevent cars from entering the bridge while it is open. The new bridge will be in the same location as the existing, but there are several differences between the bridges. 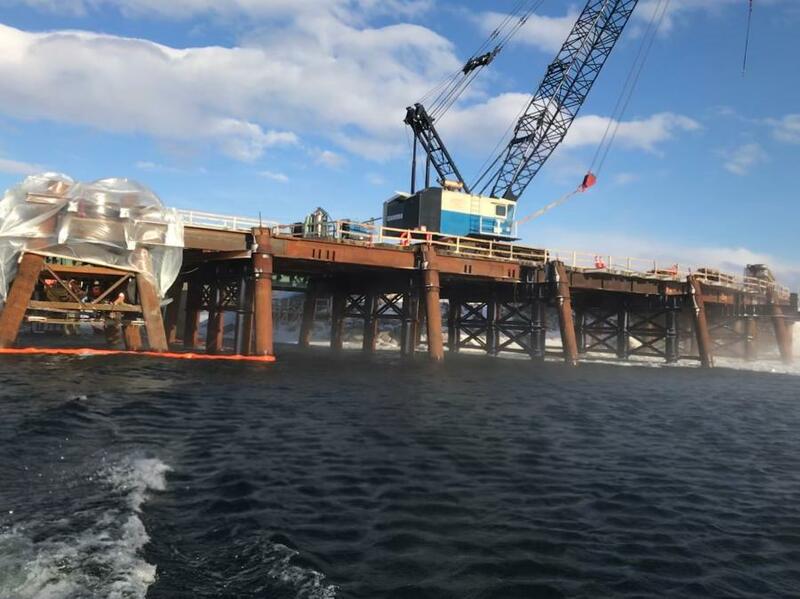 The existing bridge opened with mechanical motors, which "cranked it up the hard way," Sumner said. The new bridge will be operated with a hydraulic system. "We're building some redundancy into the operating system in the sense if one of the cylinders needs to be replaced or fixed we could still open the bridge," Sumner said. "It may not operate as quickly, but it will still operate. We're building a separate auxiliary backup system as well. Our goal is to get 75 to 100 years out of it. There may be a deck replacement before then or it may need repainted or parts replaced, but for its full life cycle we're hoping to get 75 to 100 years." In order to reach that goal, stainless steel reinforcement will be used on the deck. The opening portion will be paved with concrete to minimize the weight. 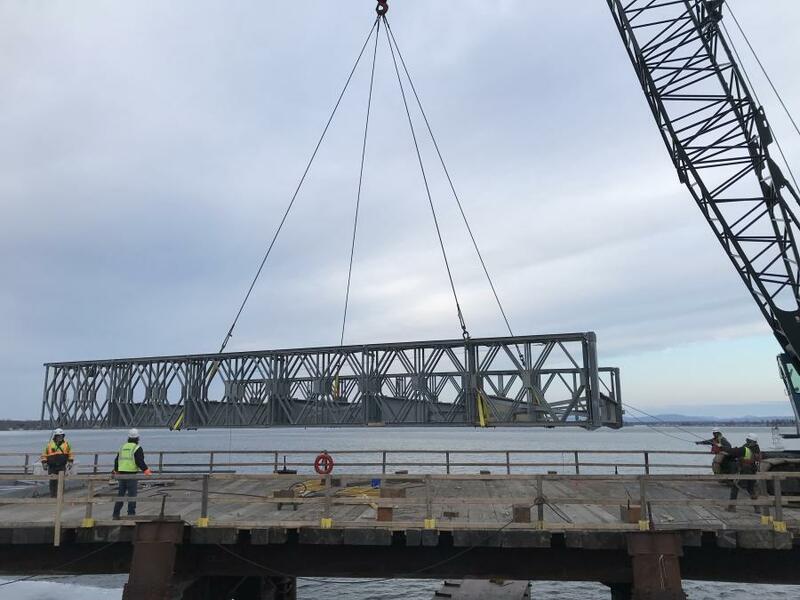 "The heavier the span, the more expensive equipment you need to lift it," Sumner said. "We also went with metalizing the girders versus painting and some of the smaller pieces we're galvanizing. We're trying to cut down on maintenance, hoping that might extend the life." The estimated completion date of the new bridge is fall 2022.